When installing a diesel particulate filter on a small engine, keeping things simple is top priority. For this reason we designed a unique system which uses electric heating elements to periodically burn off the soot which has accumulated in the filter elements. The filter is cleaned without the need for it to be removed from the machine first, and the cleaning process is started manually by the driver. The electrical power for the cleaning is normally provided by a separate battery pack. The advantage of this approach is that it removes a lot of complexity and electronics, with the result that these systems are very compact as well as simple to install and service. Because they can work even with very cold exhausts, they are installed after the standard exhaust components and connected to the tailpipe using flexible exhaust hose. We currently make two versions, one for engines below 10 kW and the other for engines in the range 10 to 20 kW. Due to their compact overall dimensions they are ideal for mini-excavators which are used in confined spaces such as during basement excavations. They are also suitable for use on mini cranes, cherry pickers and scissor lifts. In the case of equipment which doesn’t move about much, the filter unit may be mounted on a trolley. Another suitable application is on refrigerated power units (RPUs). The filter typically needs cleaning after about eight hours’ running, and the process takes 20 minutes. A portable 24 volt power pack is connected, the ‘start’ button is pressed, then when it’s finished the power pack is disconnected and put back on charge. It’s as simple as that. No tools are required, no contact with hot surfaces is involved, and no waste created. 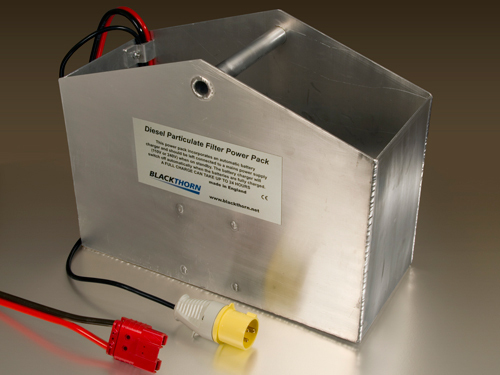 Because the power pack is portable, the filter can be cleaned even in locations where there is no mains power available, however we can supply a transformer as an alternative. How does the driver know when it needs cleaning ? The easiest approach is to tell him to do it once per shift, but there are two alternatives. The first is to connect an exhaust pressure gauge which we supply, and then clean the filter if the needle is in the red zone. Another approach is to install an electronic exhaust backpressure monitor which activates a red light and/or a buzzer. The filtration efficiency of this system has been verified at Millbrook, and is about 85%. 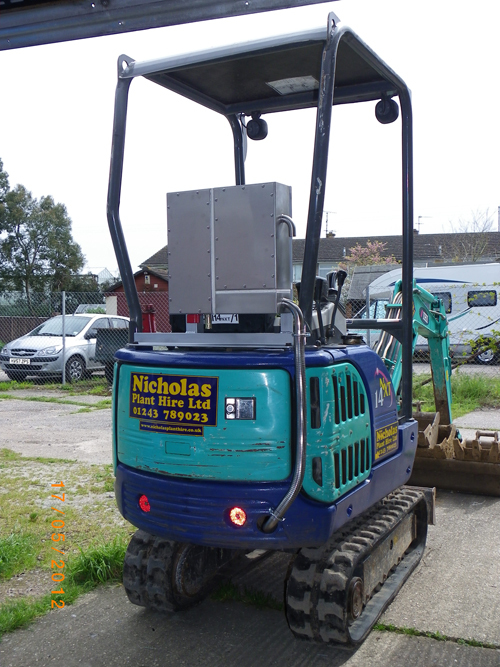 It was developed in conjunction with a plant hire company in London and has been used successfully in many basement excavations since 2010.